A full 5-piece drum kit with a 22” bass drum, the Mirage Raven Acoustic Starter Drum kit, is an excellent entry-level kit for those who want a full set at an affordable price. The Mirage Raven stands out from other entry-level kits both because of the fact that all of the shells of the kit are 6-ply making these drums highly robust and great sounding too. The easy to assemble design means you can be set up and playing away as soon as you get home. The shells, all the hardware including pedals, stands and cymbals too! Just get yourself sat down on the included drum throne and begin your fun journey towards becoming the next Thomas Lang! The shells of the Mirage Raven Drum kit are wrapped in a wine red PVC making them clean looking yet very striking in stark contrast with the chrome and dark chrome hardware, and would look cool in any practice space! As your playing progresses so does your demand for newer components. 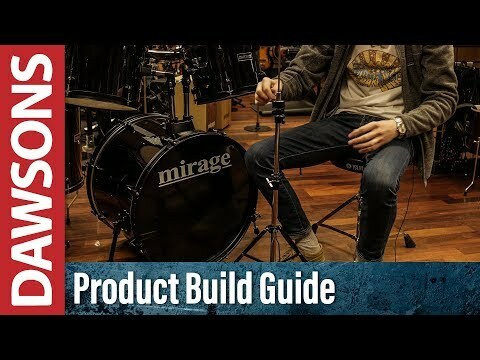 The Mirage Raven Drum kit allows you to do this with ease. Simply change your heads and upgrade your hardware whenever you feel the time comes. Although sharing the same name of Edgar Allan Poe’s object of distraction the Mirage Raven Drum kit doesn't so much as rap and tap, as bang and crash with 5 drums, a cymbal and hi-hat, along with all the necessary stands, a pedal, drum throne and even a set of sticks. Time to find your beat!